The fastest growing community of design professionals and building product manufacturers. and connects them to designers working on real-world projects throughout North America. We are the leading provider of manufacturer-specific building information, delivering product files and information to over 500,000 architects, engineers, contractors, and other design industry professionals. Trusted reviews from some of our clients about our services. "CADdetails provides the best 2d & 3d development services and delivers in-depth metrics to our management team. It's the best ROI we receive year over year! " "Our sales team uses CADdetails to assist designers in developing project-ready CAD drawings that include the products we manufacture." "CADdetails has provided us with the platform and niche audience to help us reach professionals who might not otherwise know about our products. 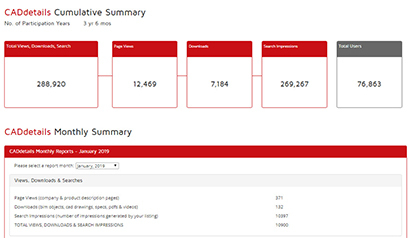 They have helped us create and distribute specific and informative content to those clients and leads who need it most or are ready to take the next step." "CADdetails’ customer service is second to none. Our product development team depends on their knowledge and attention to detail. They definitely put the details in CAD." "On first contact with CADdetails I was not sure what would make their service more valuable than other avenues that were available. Their matter-of-fact presentation and explanation was clear and persuasive and has proven to be everything they promised – and more! 5 STARS"
Give designers what they’re looking for & get specified into their project plans. Whether you are looking to enhance your existing design files or develop new 2D cad or 3D models, CADdetails' in-house design team will ensure they are created to industry standards and ready to be specified by design professionals. CADdetails provides the most comprehensive tracking and reporting service available to building product manufacturers. Take your design files with you and share them with the world. 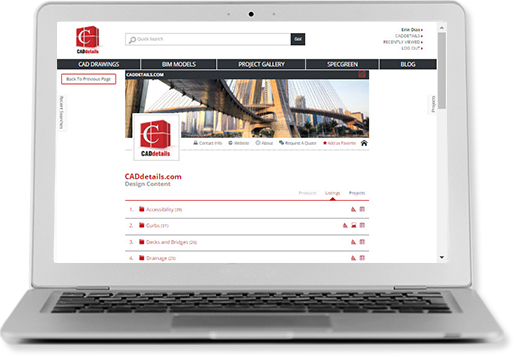 CADdetails makes it easy to distribute design content anywhere on the web, including your corporate website. Add it anywhere designers typically go to source your design content, such as an 'Architect's Corner' or 'Designers' section of your website. Real-world projects for inspiration and new design ideas. Place your products on stage and showcase them through the CADdetails Project Galleries. 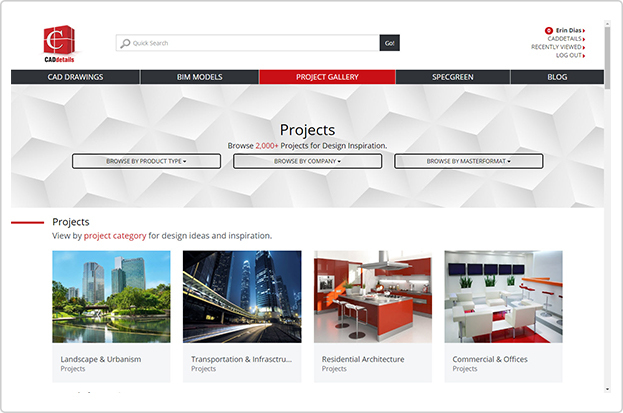 The Projects Gallery inspires designers through visuals of your most creative projects and then links them directly to the design files (cad, bim & specs) which can then be easily specified into new projects! Depended on by over 500,000 design professionals across North America.